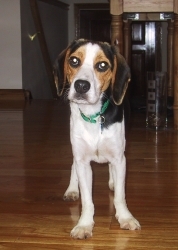 Nov. 7, 2005: We adopted Buckley from the Dubuque Humane Society. 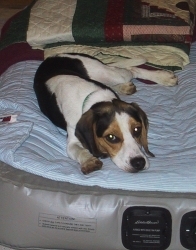 He's a tri-color beagle and was 11 months old when we got him. These are a couple of photos from his first day in his new home. Mar. 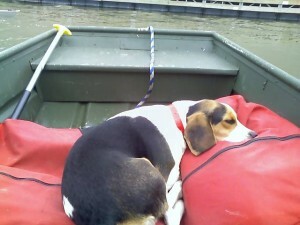 & Aug. '07: Buckley and I headed to Chicago to help the rowing team by coaching all weekend. This was Buckley's first experience in a launch and he fell asleep just as he does when he's in a car. The rowers took care of him much of the time and they grew quite fond. So in the summer they got him his very own U. Chicago Crew hoodie sweatshirt. I don't think he liked it as much as us. May '07: The weather this spring has been great so Erynn took the opportunity to read a book in the back yard. Buckley though he'd join her. May '07: Erynn was having fun with the camera one day and took a ton of photos of Buckley in the back yard. April '07: Most of his day is spent lounging around waiting for something to happen. The big highlights of the day are when we come home, if there's a rabbit in the back yard, or if he's getting a treat. I thought this photo was so cute because the forlorn look. Please won't someone come home and play with me? April '07: Buckley's big trick is to jump up and spin while begging for a treat. Always a crowd pleaser. Dec '06: Erynn and I headed to my home town for Christmas and brought the pup. He's so cute! My parents and grandma had a good time with him. Oct 26 '06: The local Doggie Daycare group in Dubuque hosted a Halloween party for their dogs, and Erynn felt it was a good idea to dress Buckley up as a ladybug. We don't think he was terribly happy, but he was darn cute. May 1 '06: We came home from work and mowed the lawn. It had rained the previous day so the cut grass was a little moist. It's hard to make out, but Buckley had these incredibly funny green paws from running around in the yard afterwards. Dec 17 '05: Dubuque has a nice dog park near the Bunker Hill Golf Course. He loves to run and play with his frisbee. Dec 31 '05: Here he is with his favorite tennis ball, and lounging on the couch. He has declared the couch his own! Feb 12 '06: Buckley during one of his crazed moments in the back yard. Feb 19 '06: Buckley sitting on his new blanket from Ma & Pa Rathburn.